Dr. Zhong Lin Wang, Regents' Professor, COE Distinguished Professor, and Director, Center for Nanostructure Characterization, at Georgia Tech, has examined the fine structure of the compound eyes of a household fly and precisely replicated its entire structure using a low-temperature atomic layer deposition technique. 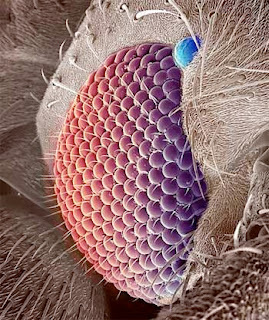 The results have been published in the December 6, 2007 online edition of Nanotechnology ("Bio-inspired fabrication of antireflection nanostructures by replicating fly eyes"). The National Institute of Standards and Technology (NIST) has developed an imaging system that quickly maps the mechanical properties of materials—how stiff or stretchy they are, for example—at scales on the order of billionths of a meter. The new tool can be a cost-effective way to design and characterize mixed nanoscale materials such as composites or thin-film structures. The NIST nanomechanical mapper uses custom software and electronics to process data acquired by a conventional atomic force microscope (AFM), transforming the microscope’s normal topographical maps of surfaces into precise two-dimensional representations of mechanical properties near the surface. The images enable scientists to see variations in elasticity, adhesion or friction, which may vary in different materials even after they are mixed together. The NIST system can make an image in minutes whereas competing systems might take an entire day. 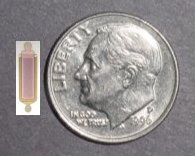 IMAGE: An atomic force microscope normally reveals the topography of a composite material (l.) NIST's new apparatus adds software and electronics to map nanomechanical properties (r.) The NIST system reveals that the glass fibers are stiffer than the surrounding polymer matrix but sometimes soften at their cores. A design of an implantable electronic device always takes into consideration the coating, as it is the only barrier that protects the gadget from fluids and from the natural immune responses of the body. Designing a protective coating for miniature electronics is an extremely difficult endevour. The silicon chip retinal implant is being developed by Second Sight, a company based in Sylmar, California, along with a consortium of university researchers. The device needs a hermetic case to prevent it from reacting with fluids in the eye. Researchers have developed an ultrananocrystalline diamond (UNCD) film that is guaranteed to be safe, long-lasting, electrically insulating and extremely tough. The coating can also be applied at low temperatures that do not melt the chip's microscopic circuits. The UNCD film is the first coating to meet all the necessary criteria for the implant, says Xingcheng Xiao, a materials scientist at Argonne National Laboratory, Illinois, who developed the film. The tiny diamond grains that make up the film are about 5 millionths of a millimetre across. They grow from a mixture of methane, argon and hydrogen passing over the surface of the five-millimetre-square chip at about 400 C. Xiao and his colleagues have already tested the implants in rabbits' eyes, and saw no adverse reaction after six months. A new study reports that a laser can be used to switch a film of vanadium dioxide back and forth between reflective and transparent states without heating or cooling it. It is also among the most recent examples of “coherent control,” the use of coherent radiation like laser light to affect the behavior of atomic, molecular or electronic systems. 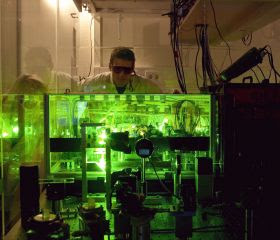 The technique has been used to control photosynthesis and is being used in efforts to create quantum computers and other novel electronic and optical devices. The new discovery opens the possibility of a new generation of ultra-fast optical switches for communications. The study, which was published in the Sept. 18 issue of Physical Review Letters, was conducted by a team of physicists from Vanderbilt University and the University of Konstanz in Germany headed by Richard Haglund of Vanderbilt and Alfred Leitenstorfer from Konstanz.